Researchers from the Department of Geography and the Institute for Environmental Science and Technology at the UAB (ICTA-UAB) have designed a new methodology with which to conduct a quantitative analysis and map the vital areas of a city. It is the first analysis which synthesises and applies the theories of Jane Jacobs on the configuration a modern city (dense populations, mixed uses and pedestrian-oriented) must have in order to have street vitality. This new tool was developed using data from the city of Barcelona and its conurbation. <p>The theories of Jane Jacobs, American intellectual and urban activist in New York during the mid-20th century, were published in her book The Death and Life of Great American Cities. They often served as inspiration for urban studies in many Anglo-Saxon countries, and to a lesser extent also in Mediterranean countries. </p>    <p>Researchers Xavier Delclòs and Carme Miralles used census and land registry data, as well as geographical information systems, to gather six variables and create an index of analysis called JANE, and finally design its methodology. The result is a detailed spatial interpretation of a conurbation which combines both attributes of traditional Mediterranean cities and of urban fabrics resulting from the modern logics of city planning. </p>     <p>&quot;The JANE index helps to understand two key elements: firstly, the way in which cities are designed and built can create environments with very different levels of street life, and secondly, in the specific case of Barcelona, one can find areas with high levels of street life in peripheral and traditionally poor districts, and therefore not only in the centre of the conurbation&quot;, Xavier Delclòs points out. </p>     <strong><p>Urban Vitality Not Only In Historic Centres</p></strong>     <p>The distribution pattern of urban vitality identified by researchers can be explained largely by the presence of cities and historic centres in the conurbations analysed, which fulfil the requirements proposed by Jane Jacobs. Thus, there are three "corridors" of vitality, spreading out from the centre of Barcelona: one towards the district of Gràcia – which constitutes the vertebrate of vitality of the whole conurbation, another towards the northeastern border of the town of L'Hospitalet de Llobregat and a third one veering north towards the districts of Horta-Guinardó and Sant Andreu. Isolated from these three, researchers detected two more satellite vitality points, in the town centres of Santa Coloma and Badalona. In addition to these main points, there is a high level of vitality in peripheral neighbourhoods which do not coincide with any historic fabric, such as the streets of Rambla Prim in the Sant Martí district, and Via Júlia in the Nou Barris district. "This demonstrates that urban vitality can also be found in new developments, if they are designed correctly", Carme Miralles explains. "These two points were redesigned before the Olympic Games and the urban projects took into account the long-standing demands of neighbours. This may explain to a large extent the success in bringing life into the streets". In contrast, the areas with little or no vitality are found mainly in the outskirts of the city, where there are numerous examples of isolated buildings, a legacy of the urban sprawl of the 1960s and 1970s. However, the study specifically highlights in these categories the harmful effects of recent urban constructions which have failed to meet the requirements of Jacobs, such as the neighbourhoods of Vila Olímpica, [email protected] and even some specific areas in the vicinity of the Diagonal Mar shopping centre. "We need an in-depth analysis about the conditions not being fulfilled in these specific projects: building types and uses, density and diversity of inhabitants, etc., in order to generate the variety needed to make it not only a place in which to reside, but also a place in which to live life," Carme Miralles indicates. "The tool we created characterises the urbanised area and its theoretical capacity to foster urban life according to the variables proposed by Jacobs. The index can be applied to other cities, given its simplicity in definition and the fact that it uses data which is generally available to the public. This is nevertheless only the beginning. We aim to improve it and add new variables which could be specific to each type of city in which it is applied, and relate it to other data on how these environments are used and how specific phenomena existing today came into being", the researchers conclude. This would be the case of Barcelona, for example, in which researchers see a relevant difference with vital cities of Jacobs' period in the phenomenon of tourism, which is causing vitals areas such as Gràcia, Ciutat Vella and Poblenou also to become scenarios of gentrification processes and overpopulation. The region analysed includes the city of Barcelona and 9 surrounding towns, with a total population of approximately 2.4 million inhabitants. 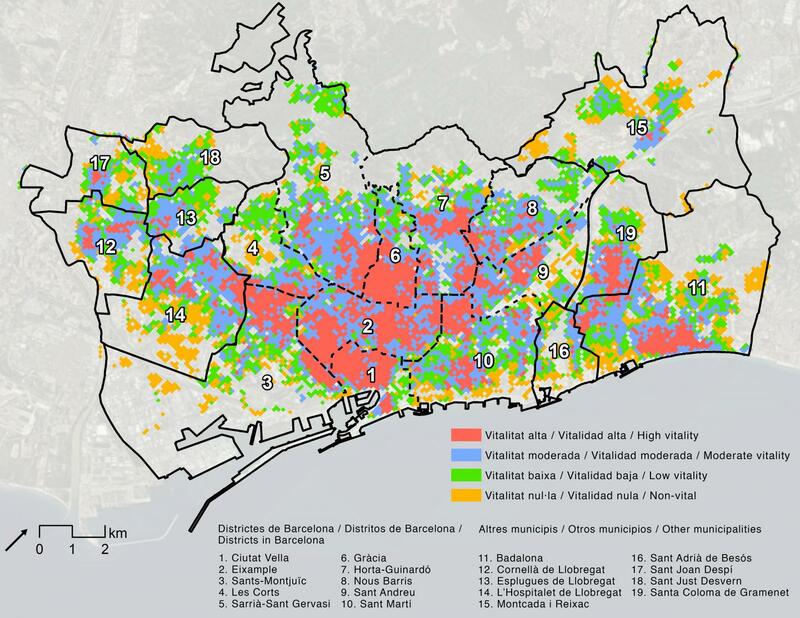 The results indicate that the levels of vitality in the Barcelona conurbation are far from being homogeneous: 23% of the area presents a high level of vitality, while 34% is moderate, and a significant part is classified as little (25%) or none (17%). Researchers took into account six indicators to measure the degree of vitality in each of the areas, 4 basic and 2 complementary: 1) Concentration – density of inhabitants, households and buildings; 2) Diversity – mix of primary uses of buildings (residential, professional, commercial and institutional); 3) Opportunities for contact – with constructions favouring a certain degree of interpersonal contact, with intersections provided by small blocks of buildings and human-scaled streets; 4) Mixture of old and new buildings – which in theory represents different levels of income and uses; 5) Accessibility – distance to public transport and pedestrian streets; and 6) Distance to empty "frontier" spaces – created by large transport facilities, buildings with one sole purpose (such as hospitals) and large green areas.